says "Total Dhamaal is an Indian Hindi-language adventure comedy film directed and co-produced by Indra Kumar. The film stars Ajay Devgn, Riteish Deshmukh, Arshad Warsi, Javed Jaffrey, Madhuri Dixit, Sonakshi Sinha, Niharica Raizada, Esha Gupta and Anil Kapoor." to get instant updates about 'Total Dhamaal' on your MyPage. Meet other similar minded people. Its Free! 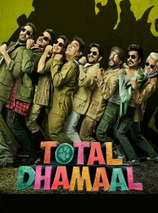 total dhamaal says "Total Dhamaal is an Indian Hindi-language adventure comedy film directed and co-produced by Indra Kumar. The film stars Ajay Devgn, Riteish Deshmukh, Arshad Warsi, Javed Jaffrey, Madhuri Dixit, Sonakshi Sinha, Niharica Raizada, Esha Gupta and Anil Kapoor." Total Dhamaal is an Indian Hindi-language adventure comedy film directed and co-produced by Indra Kumar. The film stars Ajay Devgn, Riteish Deshmukh, Arshad Warsi, Javed Jaffrey, Madhuri Dixit, Sonakshi Sinha, Niharica Raizada, Esha Gupta and Anil Kapoor.